[Shhhhh!] The Morgan Bar opens tonight! Big style! Perhaps you have noticed the workers on Bogart and Varet in Bushwick working like busy bees… And most likely you have noticed the wooden 1920s style bar being created in front of your eyes when coming from the Morgan subway stop. And maybe you were lucky enough to catch the soft launching of The Morgan 3 weeks ago. If not do not despair! Because [the very secret] bar at 25 Bogart St. opens for real tonight with all the festivities! Richard Guishard and Jitka Karlikova, both artists and Richard specializing in interior design, are the co-owners and are promising a lot of fun. 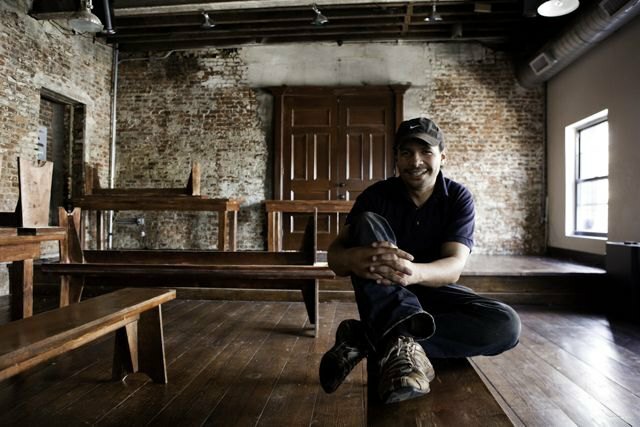 The Morgan will be probably the biggest live music venue in Bushwick with 3 [!!!] stages. We have seen the 1st of the them during the soft opening; additionally there is a music lounge in the basement that opens tonight for the 1st time; and in about 2 weeks the 3rd live music space opens in the back. Tell us about the plans for tonight? So we are going to start the night around 9pm with a burlesque dance. We are having free samples of the food from our menu until 10pm. And then we have 3 bands in the basement, in the Morgan Lounge. Oh there is a lounge in the basement? That’s crazy! This is huge! So since today The Morgan will be open every day? Yes. Every single day. From 5pm to midnight on weekdays and from 11am for the brunch until like 2am on the weekends. Do you plan to have weekly events? Yes, definitely, we will have concerts... We want to target Bushwick and Williamsburg people, maybe also people from Manhattan. Depending on the type of the event and on the promoter. What will be your music preference here? I don’t have a particular music inclination, but I want this place to be a reflection of the neighborhood. I want people to contribute. I want local bands, but also performances, lectures… I want this to be a community center. Yes, we will be having rotating exhibitions. So come and say hi tonight from 9pm at The Morgan at 25 Bogart St. (corner Varet) on Morgan L train.